Not to be confused with The Kids Are Alright (film). The Kids Are All Right is a 2010 American comedy-drama film directed by Lisa Cholodenko and written by Cholodenko and Stuart Blumberg. A hit at the 2010 Sundance Film Festival, it opened in limited release on July 9, 2010, expanding to more theaters on July 30, 2010. It was released on DVD and Blu-ray on November 16, 2010. The film was awarded the Golden Globe Award for Best Motion Picture - Musical or Comedy, and Annette Bening was awarded the Golden Globe Award for Best Actress – Motion Picture Musical or Comedy. The film also received four Academy Award nominations, including one for Best Picture, at the 83rd Academy Awards. The younger child Laser (Josh Hutcherson) wants to find his sperm donor father but has to be 18 to do so. He implores his 18-year-old sister, Joni (Mia Wasikowska), to contact the sperm bank which identifies Paul (Mark Ruffalo) as the donor. The three meet. Joni is impressed by his bohemian lifestyle, and Paul becomes enthusiastic about being in their lives. Joni swears her brother to secrecy as she does not want to upset their mothers. However, Jules and Nic find out and invite Paul over to dinner. When Jules reveals she has a landscape business, Paul asks her to transform his back garden. Jules agrees, although Nic does not like the idea. While working for Paul, Jules likes that he appreciates her work in contrast to Nic who, Jules feels, never supported her career. Jules impulsively kisses Paul one afternoon, and they end up in bed together, beginning an affair. Jules and the kids start spending more time with Paul. Nic believes Paul undermines her authority over the children by, for example, giving Joni a ride on his motorcycle—which Nic has forbidden—and by suggesting she give Joni more freedom. After a heated argument with Jules, Nic suggests they all have dinner at Paul's house to ease the tension. Nic relaxes and for the first time connects with Paul. However, Nic discovers traces of Jules's hair in Paul's bathroom and bedroom. When they return home, Nic confronts Jules. At first, Jules denies it but then admits to the affair. Nic is devastated, but Jules assures she is not in love with Paul and has not turned straight; she just wanted to be appreciated. Joni and Laser have overheard the arguments and are also upset at Jules. The household becomes tense and Jules is forced to sleep on the couch. Paul thinks he has fallen in love with Jules and suggests she leave Nic, bring the kids, and come live with him. Jules declines, disgusted with Paul's lack of understanding about their relationship. The children are angry at the both of them. The night before Joni leaves home to go to college, Paul turns up at the house. Nic angrily confronts him, calling him an interloper, and tells him that if he wants a family, he should make one of his own. Rejected, Paul watches Laser from outside the window, trying to get his attention, but Laser ignores him. Later that night, Jules tearfully admits her errors to her family and begs their forgiveness. The next morning, the family takes Joni off to college. While Nic and Jules together hug Joni to say goodbye, they also affectionately touch each other. During the ride home, Laser tells his mothers that they should not break up because they are too old. Jules and Nic giggle, and the film ends with them smiling at each other and holding hands. Annette Bening as Dr. Nicole 'Nic' Allgood, an OB/GYN specialist and the principal breadwinner of the family. She is Joni's biological mother. Nic feels threatened when the children decide to bring Paul into their lives and worries he will disrupt the family dynamic. Her fears prove true, when he begins an affair with her wife, Jules Allgood. She battles alcoholism, eventually restricting herself from alcohol. Julianne Moore as Jules Allgood, was the main homemaker who never had a formal career, but is starting a landscape design business. She is Laser's biological mother and Nic's wife. Mark Ruffalo as Paul Hatfield, the owner of an organic foods restaurant who likes women, but also his freedom. He was the anonymous sperm donor for both children. Mia Wasikowska as Joni Allgood, who has recently turned 18 and is set to leave for college. She is Laser's older sister and was named after Joni Mitchell, Nic's favorite female singer. Josh Hutcherson as Laser Allgood, the 15-year-old son who asks Joni to help him meet their biological father. Yaya DaCosta as Tanya, an employee and occasional lover of Paul. Eddie Hassell as Clay, a friend of Laser whom Nic and Jules think is unstable. Zosia Mamet as Sasha, a close friend of Joni. Kunal Sharma as Jai, a close friend and lover of Joni. Lisa Cholodenko and Blumberg began outlining the script in late 2004, based in part on some aspects of her life. The project was helped to get off the ground by the caliber of actors who agreed to join, first Julianne Moore, followed by Mark Ruffalo and Annette Bening. Cholodenko stated, "People really admired what Stuart [Blumberg] and I got on the page but there was a fear factor regarding how the film was going to make money, as the subject matter is tricky." The film nearly got the green-light in 2006, but Cholodenko postponed the project after she became pregnant by way of an anonymous sperm donor. After giving birth, she resumed work on the film and won financing from three major investors, including the French distributor UGC. Principal photography was completed in 23 days in Los Angeles in July 2009. The film was made for approximately $4 million. The filmmakers rushed to finish the post-production in time for the Sundance Film Festival, where it was admitted after the deadline for competitive entries. On January 25, 2010 the film had its premiere, becoming one of the festival's breakout hits. A few days later, Focus Features acquired the distribution rights for $4.8 million. At the 60th Berlinale the film won a Teddy Award. The film closed the 2010 Sydney Film Festival and opened the Los Angeles Film Festival. Opening in limited release at seven theaters, The Kids Are All Right grossed $491,971 in its first weekend. At $70,282 per theater, the film scored the highest average gross in 2010 as of mid-July 2010. It expanded to 38 theaters on July 16, then 201 on July 23, and finally 847 on July 30. As of December 20, 2010, the film grossed a total of $34,705,850 worldwide. The film was released to universal acclaim from critics, with Bening receiving widespread praise for her performance. Review aggregator Rotten Tomatoes reports that 93% of critics have given the film a positive review based on 209 reviews. The site's consensus is that "Worthwhile as both a well-acted ensemble piece and as a smart, warm statement on family values, The Kids Are All Right is remarkable." Metacritic, which assigns a weighted average score out of 1–100 reviews from film critics, has a rating score of 86 based on 39 reviews, with the film in the "universal acclaim" category. The film appeared on 39 critics' top ten movie lists for the year 2010. Anthony Quinn of The Independent and Elizabeth Weitzman of the Daily News both listed it as the best film of the year, while four other critics picked it as the second best movie of the year. Annette Bening won the Golden Globe Award for Best Actress – Motion Picture Musical or Comedy, and the film won the Golden Globe Award for Best Motion Picture - Musical or Comedy. Nominations were also given to Julianne Moore for Best Actress and Lisa Cholodenko and Stuart Blumberg for Best Screenplay. Moore and Bening were both nominated for the BAFTA Award for Best Actress in a Leading Role, and Mark Ruffalo was nominated for the BAFTA Award for Best Actor in a Supporting Role. Cholodenko and Blumberg were also nominees for Best Original Screenplay. The film was nominated for Best Picture at the 83rd Academy Awards. Bening and Ruffalo were nominated for Best Actress and Best Supporting Actor respectively. Cholodenko and Blumberg were also nominated for Best Original Screenplay. Laura Rosenthal and Liz Dean won the Artios Award for Outstanding Achievement in Casting - Feature - Studio or Independent Comedy, given by the Casting Society of America. The Kids Are All Right was listed on many critics' top ten lists. On October 14, 2011 it was reported that Cholodenko was in the process of creating a series based on the film for HBO. In 2014, Mark Ruffalo said that he had to pass on working on her latest project, a TV series based on the Australian novel The Slap. 1 2 Farley, Christopher John (July 7, 2010). "'The Kids Are All Right': Director Lisa Cholodenko on Her New Film". The Wall Street Journal. Retrieved July 14, 2010. 1 2 3 4 "The Kids Are All Right Box Office Results". Box Office Mojo. Retrieved December 20, 2010. ↑ "Theatre List". Focus Features. Retrieved July 16, 2010. 1 2 3 Horn, John (June 17, 2010). "'The Kids Are All Right' is an appropriate opener for the Los Angeles Film Festival". Los Angeles Times. Retrieved June 17, 2010. 1 2 3 Phillips, Michael (June 25, 2010). "The woman behind 'The Kids Are All Right'". Chicago Tribune. Retrieved June 29, 2010. ↑ Toumarkine, Doris (June 28, 2010). "Family dynamic: Lisa Cholodenko explores modern parenthood in 'The Kids Are All Right'". Film Journal International. Retrieved June 29, 2010. ↑ Arguelles, Alannah (July 2, 2010). "All in the Family at The Kids Are All Right Premiere". Vanity Fair. Retrieved July 2, 2010. ↑ Douglas, Edward (July 6, 2010). "Exclusive: The Kids Are All Right Director Lisa Cholodenko". ComingSoon.net. Retrieved July 6, 2010. ↑ O'Hehir, Andrew (January 26, 2010). "Sundance, "The Kids Are All Right": Scenes from a lesbian marriage". Salon. Retrieved February 6, 2010. ↑ Zeitchik, Steven (January 26, 2010). "Sundance 2010: 'The Kids Are All Right' becomes a Sundance sensation". Los Angeles Times. Retrieved February 6, 2010. ↑ Friedman, Roger (January 26, 2010). "Julianne Moore, Annette Bening in Sundance Sensation". The Hollywood Reporter. Archived from the original on January 30, 2010. Retrieved February 6, 2010. ↑ Schwartzbaum, Lisa (January 30, 2010). "Sundance: 'The Kids Are All Right,' 'Winter's Bone,' and films from around the world". Entertainment Weekly. Retrieved February 6, 2010. ↑ Swart, Sharon (January 28, 2010). "Flurry of deals take fest to finish". Variety. Retrieved February 6, 2010. ↑ Macaulay, Scott (May 4, 2010). ""Kids" Opens L.A. Film Fest; Line-up Announced". Filmmaker (magazine). Retrieved May 4, 2010. ↑ "Festival to showcase 157 films". The Australian. May 5, 2010. Retrieved May 4, 2010. ↑ "'The Kids Are All Right' enjoys high-grossing debut in limited release". Los Angeles Times. July 11, 2010. Retrieved July 11, 2010. ↑ Knegt, Peter (July 11, 2010). "Box Office: "Kids" Scores Year's Best Specialty Debut; "Fire" & "Winnebago" Also Strong". indieWire. Retrieved July 11, 2010. 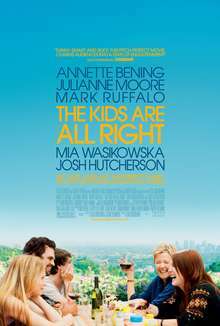 ↑ "The Kids Are All Right (2010)". Rotten Tomatoes. Retrieved February 22, 2011. ↑ "Kids Are All Right, The". Metacritic. Retrieved July 27, 2010. ↑ "2010 Film Critic Top Ten Lists". Metacritic. Retrieved 2012-10-05. ↑ "2011 Artios Award Nominations for Outstanding Achievement in Casting". Casting Society of America. 2011. Retrieved January 7, 2012. ↑ "Casting 'The Kids Are All Right' TV Show". Aoltv.com. Retrieved 2012-10-05. ↑ "Mark Ruffalo Talks BEGIN AGAIN, Connecting to His Character, Dirty Feet, Playing a Convincing Drunk, Passing on Lisa Cholodenko's New Show and More". Collider.com. Retrieved 2014-07-06.